Over the past couple of years, I've met many artists and it's always fun and awe-inspiring to see their creativity in action. Along the way, however, I've met four who seem to fall into a different category … one that I've been calling "extreme creatives" … people whose creativity is an unstoppable flood that gets channeled into their environment. One well-known example is Watts Towers, created by one man, Simon Rodia over 34 years. The artists I've met … all women … are not famous but they are each remarkable. Last weekend, I visited Ginny Mancuso in Atascadero and saw her Enchanted Forest, an ever-changing work of art where Ginny wields a concrete-mixer the way most artists handle a brush. 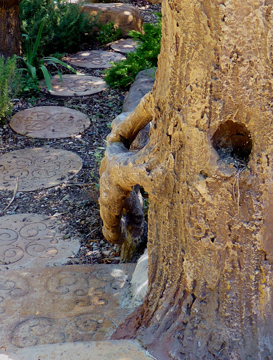 She has created free form concrete stumps, walls, fountains and fantasy environments on the blank canvas of land she purchased in the 70s. 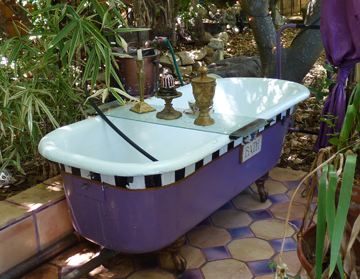 In this art-filled world, there is also an outdoor bathtub … not so unusual other than the fact that this one is fully functional and in a setting so inviting she could charge a fee that I would gladly pay for the privilege of bathing in that sanctuary. There's also an open air toilet … fully functional, an outdoor sleeping room, several outdoor sitting areas, tea party alcoves and a few dining areas. After building her house, her contractor asked her why she bothered with the house and she replied that she needed some place to keep her stuff. Everywhere you look, there are words, color, sparkle, fairies, dragons, and magic. 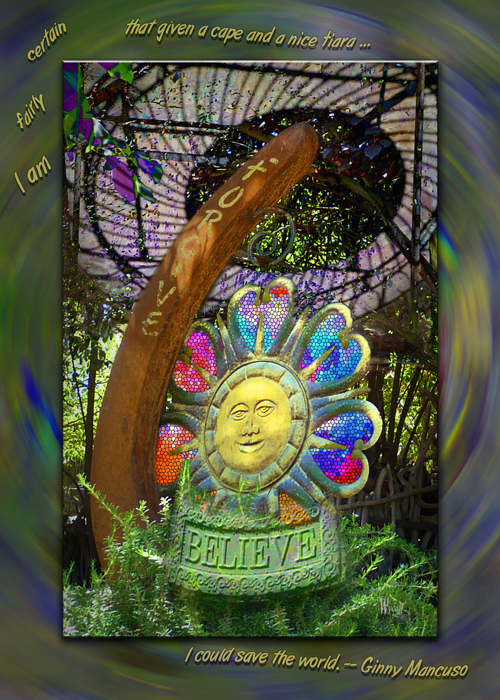 After visiting with Ginny and being invited to come back at night when it lights up (an offer I will definitely accept), I made a piece of art from her art garden. I'll share that and just a couple of photos from her garden with the hope that they inspires you as much as they did me. What a magical, mystical being she is -- and what a magical place she's created. I love your art piece of her art piece. Lovely! Dear Joyce...Somehow, I landed on your site and want to say your take on Ginny's art is delightful. I'm sure she must've loved it too. Unfortunately, we lost "our Ginny" (everybody's Ginny actually) to cancer on February 10th, 2019. She is so missed by so many.